Wow! This was intense! That pyramid work was hard! Great class! Oh by the way I thought I’d mention an Epson salt bath is going to be necessary if I’m going to tackle a hike tomorrow at 10,000+ feet of elevation. Absolutely one of the best spin sculpts in the library coached by wonderful Meredith! Awesome! Thanks for the reminder about this great class Nicky! Just got done and yes – this is an excellent workout that is perfectly coached by Meredith. I will be doing this one again!! This was an amazing class!! I don’t even remember the music because I was so focused on what you were saying!!! Perfectly coached!! Jeezo..those ladders and climbs were tough Meredith.I loved it all tho and definitely got a great workout..cheers!! Drills are the best!! Tough but awesome!! Loved working so many different muscle groups in this class after sitting in the car all day yesterday! What a tough, complete workout this is and so fun. Awesome. That was great! I love ladder drills and climbing, so this was super fun for me. Was glad the sound issue toward the end was fixed. Love Meredith Amazing class .Loved the music ,energy and above all it concentrated on entire body movement.Kindly keep all these kind of energy music track for all the spin classes. Great format! Loved the ladders…and your intensity was fantastic!!! Thanks so much Meredith…great workout! Loved this one! Ladder drills gave it sweaty goodness and helped the time fly by. Great cuing and creative variety of moves in and off the bike. Fabulous class! Great class…so glad I didn’t quit! Amazing class! I was sweating and challenged from the first minute! OMG! What an awesome workout! Great class Meredith! Didn’t quit but I may have cursed when you said Man Makers!! Great class! Great ab work at the end, thank you! Yep, this was amazing!!! Great form pointers, Meredith! Loved the ladders. I am jiggly all over, just like I like to be after a SpinSculpt! You made every minute count! Meredith – that was a brilliant workout!! A most excellent and very challenging spin! The ladder format with the sculpting was very hard. So sweaty and feeling accomplished! Thank you so much! Great music too! was awesome!! – I forgot the “was”! Told you I was tired! Great class! I did this earlier and my legs are feeling it, I will be nice and sore tomorrow. Awesome class Meredith! Love the format and the ladder drills. Thank you! THE most POPULAR class in our San Diego Studio for a reason, here comes a full hour body sculpting, fat melting Spin®Sculpt class. 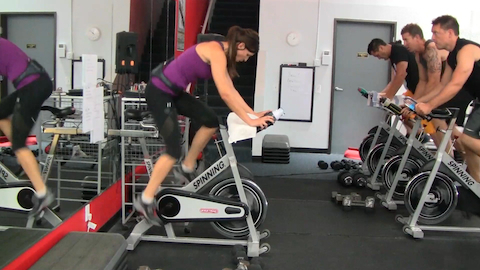 The riding portions are cardio killers where you’re focused and driven. The sculpting portions are… perfect with resistance training ladder style sets that carve that body up. So so good! 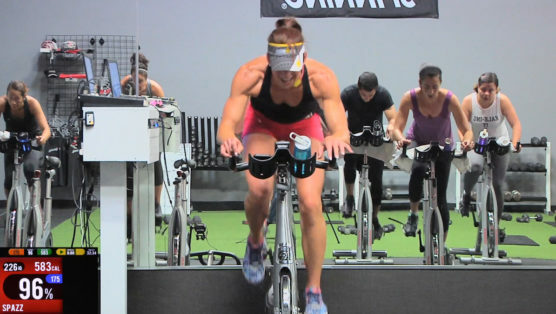 Get ready to feel the burn on and off the bike with this fast-paced Spin Sculpt workout! 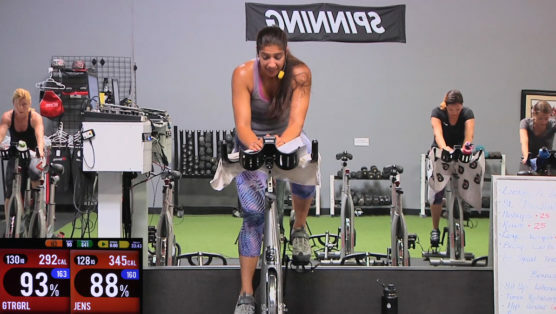 Between cardio bursts on the bike, you’ll experience 5 muscle-toning dismounts ranging from 3-5 min where your heart rate will stay in that fat burning zone and your muscles will scream for rest. Every muscle group is targeted with some body weight sets, along with some combination lifts with dumbbells. Note* please have a light set of dumbbells (or grab a couple of water bottles to use) as backups in case, as some exercises challenge not only strength and endurance, but also core stability/balance. I hope you have as much fun going after this workout as I had bringing it to you! Work hard, rest later, rock on Studio SWEAT Machines! This killer class, originally released on May 18, was so wildly popular that we decided to release it as a down-loadable class for those days where your Internet isn’t available… so here you go! Game Time. 67 minutes. Warm up. Four (12) minute quarters. Quarter 1 – On the floor building lean muscle super-set style. Quick Breather. Quarter 2 – On the bike sprinting, recovering. Loading, recovering. Threshold training at it’s best. Half-time Breather. Quarter 3 – Back on the floor. This time powering through a ladder drill aimed at strengthening the legs, glutes, triceps and SHOULDERS. Quick Breather. Quarter 4 – Finishing Strong. Ride it out endurance style thinking climb, climb, climb. Cool down. Stretch it out. Did that really just happen? What an hour. This is one heart pounding workout baby! We spend the first portion of this killer Spin Sculpt fusion class with all the riding up front in one strong set. There is endurance focus, which makes for a great ‘in the moment’ fat burn. It’s fast paced with short, but well earned recoveries. The second half you’ll find that the floor time is an incredible challenge of strength, endurance, and mental toughness! You’ve got a challenging 300 rep drill, where your goal is to complete 2 full rounds with minimal rest between exercises. Have a towel ready, because you’re about to experience a super SWEAT session!